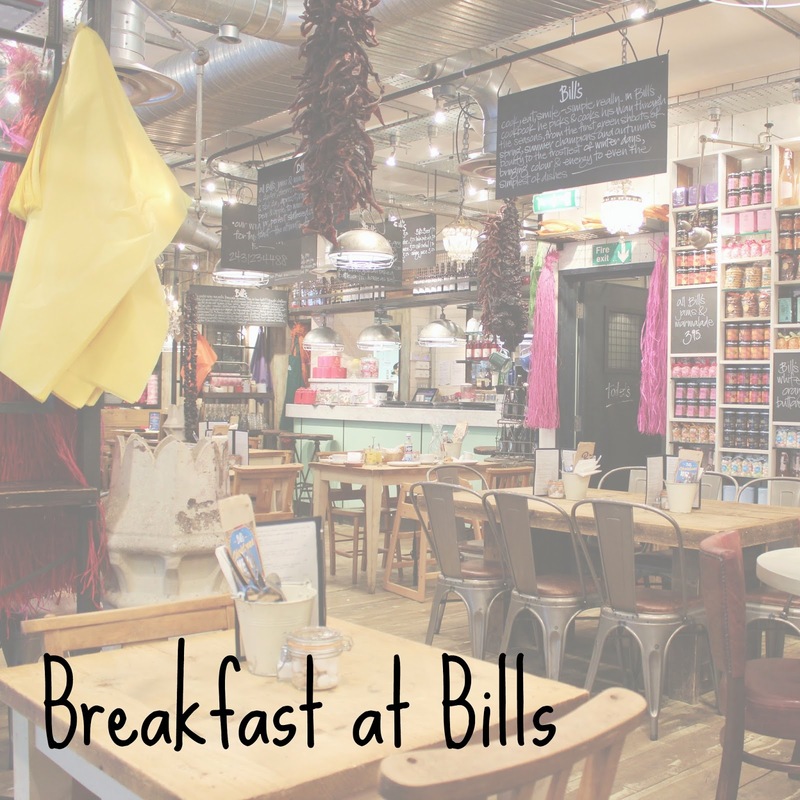 Before we headed off to the BBC Good Food Cakes and Bakes Show myself and my sister headed to Bills for breakfast. I had heard great things about Bills from lots of bloggers and vloggers, so was very eager to try it out. The interior was really cool, with a huge array of products for sale lining the walls, but it wasn't so cool that you feel out of place. We grabbed a menu each and started debating what to have. The waiters and waitresses were that perfect mix of leaving you alone to a leisurely breakfast, whilst also being attentive enough that you never wanted for anything. I really like that there was a brown paper bag in each cutlery pot, so if you wanted to take something home with you it was really easy to manage it. Good idea Bills! Nat went for eggs royale, which is smoked salmon and poached egg with hollandaise sauce on sourdough toast, topped with pumpkin seeds. I didn't get to try any, but I was assured that it was really tasty. I went for the vegetarian breakfast, not because I am a vegetarian, but because it sounded like the most unusual thing on the menu. It was two slices of sourdough toast, one topped with hummus and tomatoes, the other with guacamole and mushrooms, with poached egg and lots of sweet chilli sauce. It was incredible. A complete taste sensation, and something I will be recreating for Rich at some point. The mixture of flavours and textures worked wonderfully together and it was a light but satisfying start to the day. Happily full, we headed off to the Business Design Centre to start our day of cake eating, which you can read all about here. I can't wait to go back to Bills again, hopefully for lunch or tea this time, as I have heard that they're yummy too! I have loved reading through your blog the last few minutes. Thank you for leaving me your link on twitter! Your blog is so fun and unique. Plus, I know we'd be the best of friends between our love for good food and Harry Potter :) I'm going to subscribe on bloglovin now! Can't wait to read more in the future!